Home > Uno > Short 'n Sweet Reviews: More Nintendo Switch ports! Short 'n Sweet Reviews: More Nintendo Switch ports! It’s time for another edition of short ‘n sweet reviews with the Nintendo Switch; the console that keeps on giving. Once again, I’m looking at a series of games that are already available on other consoles, but have made their way to the Nintendo Switch, adding a dash of portability and easier local multiplayer to the base experience. Like more fans of board games, I’m not a massive fan of Monopoly. I have a great James Bond edition of it, because every household needs a copy of Monopoly, but the near complete reliance on those damn dice rolls makes for a game that isn’t particularly well balanced. It’s was the family board game you grew up playing when you were young, and is of course a very casual game that just about everyone knows, so it’s easy to pick up and play in social situations, but it’s not the kind of board game I would choose to play, now, over the many better modern games out there. Related reading: Matt's review of the game's PlayStation 4 release. 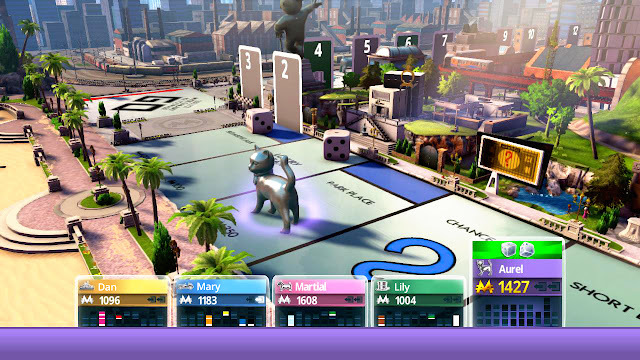 Monopoly on the Switch works, much as it did on PlayStation 4. There are some nice little elements, like themed boards, which don’t change the gameplay in any way, but are fun to see. All the popular Monopoly house rules are in there too, so however you like to play the game you’re covered. Loading times are a bit long, and the AI takes its sweet time to take each turn, but otherwise it’s a very clean, visually appealing take on the board game. But, again, this is Monopoly, and there’s only so much mileage I can get out of it. AI is predictable on all levels of difficulty. What changes is the dice rolls seem to be more heavily balanced in the AI’s favour as you up the challenge. Actually, that’s the biggest issue I have with the recent Monopoly releases, and the Switch version is no different; the randomness of the dice doesn’t feel nearly random enough. That or the fact I swung in and out of luck depending on whether I was winning at the time over a dozen plays was pure coincidence. And it might well have been coincidence, but that’s the problem with Monopoly as a game; it relies too much on luck and it’s hard to spin that into something entertaining. Uno is another one of those classic games that’s so easy to pick up and play with anyone, at any time. Who hasn’t got into a heated game of Uno down the pub on a Sunday afternoon before? For all its simplicity this is a game that has just enough strategy that you’ll always feel agency over the results of the game, and that makes it ideal for a very light, casual, game experience. Related reading: Matt's full review of the original release of the game. 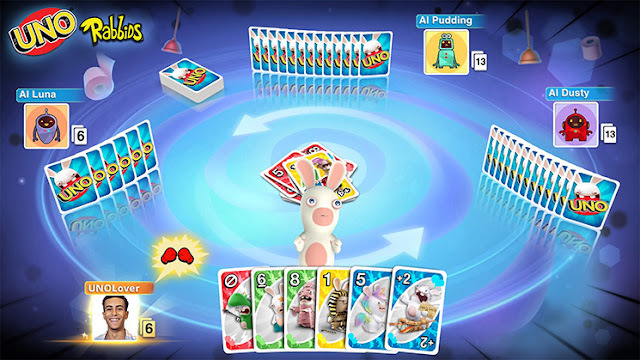 On the Nintendo Switch you’ve got a couple of alternative card graphics (regular Uno, and also a Rabbids and Just Dance-themed one), as well as the single player and online play options that the previous console version had. For people with multiple Switches there is wireless play, which works well, but you'd have to say a simple pack of Uno cards would be cheaper in that kind of setting. And, as with Monopoly, the most popular house rules are optional ways to spice up the game. Unlike Monopoly, which has painful loading times, Uno plays really nicely, loads quickly, and the cards are nice and clean. The presentation is simple, but again, it’s clean, and that’s what you want from a game like this. What lets Uno down is the online infrastructure. There aren’t many players, for a start, and it hurts the appeal of playing online when it ends up being against one human player and two AI. You may as well just play the single player, especially considering how frequently drop outs happen. Conveniently this happens most frequently when the other human player is close to losing. There doesn’t seem to be a punishment in place for that. At least AI players have honour. The best thing about Crimsonland is the cover art. It’s a homage to the original Doom, and it promises a hard-rocking action game filled with gore, set against an apocalyptic setting. What you get is a bland top-down dual stick shooter that works, and is entertaining enough, but it is so painfully bland it can't possibly live up to what the cover art promised. Related reading: Our take on the game's PlayStation 4 release. 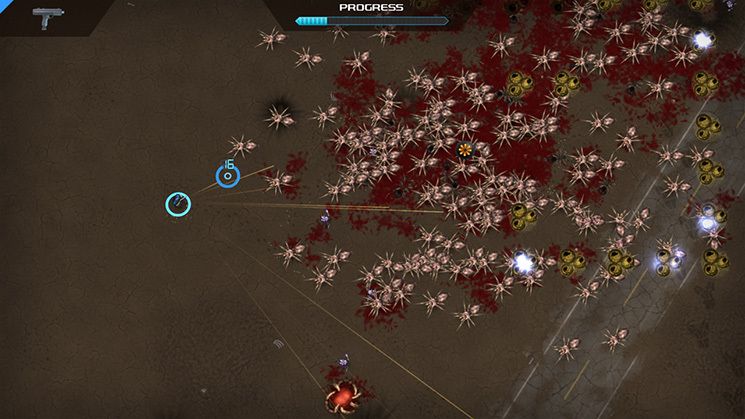 There’s no doubt Crimsonland has been popular. It’s been released on everything known to mankind over the last half decade or so that it’s been around. But it really is the dictionary definition of “generic”. There’s lots of levels of escalating difficulty to play through, but they all play out the same way: kill everything before your character’s health runs out. Enemies are tiny on the screen and lack any interesting features. Really they’re there to paint the otherwise featureless environment red as you splatter them. Playing single player helps you unlock additional weapons and perks, which make surviving in the survival mode easier, and that’s where the real meat and longevity of the game is. An online leaderboard makes hunting for high scores as worthwhile as this game will get. I can’t imagine the community for it will be massive on the Switch, but for people that do enjoy it, there will be competitive replay value there. Of course there are a lot of top down shooters on the Switch now. Some, such as Jydge or Mr Shifty, actually do some interesting things with the structure. Crimsonland is the polar opposite. It’s the safest, most generic example of the dual stick shooter in years. There’s no denying there’s a visceral thrill in the action that it offers, but let’s just say it’s just as well the game’s priced to be a cheap bit of throwaway fun. I really enjoyed Superbeat XONIC on the PlayStation Vita, without rating it quite as highly as my beloved Hatsune Miku, IA and Persona rhythm games. 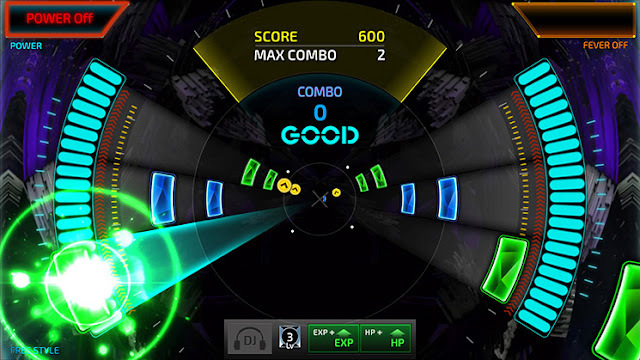 But as a more serious rhythm game for more serious rhythm game souls there’s no denying the quality of this one. Related reading: Matt's more in-depth review of the game on PlayStation Vita. On the Switch, it’s a similar story. I really enjoy it, but it doesn’t quite have the personality that existing Switch rhythm games - Deemo and Voez - do. The nightclub vibe of the interface is really neat, and this one does have the advantage that it’s competitive in nature; you’ll play a couple of tracks in succession, and the combined score will count towards your leaderboard ranking. Being good at any good rhythm game is a genuine feat of skill, so those leaderboards are compelling in and of themselves. That's something the other rhythm games do not have. But Superbeat’s failing – beyond the lack of a defining personality - is some of the music choices. The game tries hard to cover a wide range of genres, but in doing so it’s going to leave most players absolutely hating some of the music. I can’t stand R & B, metal, and hard rock music (for the most part). The presence of a handful of tracks in each of those genres just limits the number of tracks I want to actually play. On the other hand, a fan of the harder music genres will be bored out of their mind playing the Latin American or sweet Asian Pop tracks. A rhythm game can’t be something for all people, and I do think that rhythm game developers are better off targeting their playlists towards specific audiences. That being said, these are such minor complaints in Superbeat, set against the sheer quality of the mechanics. 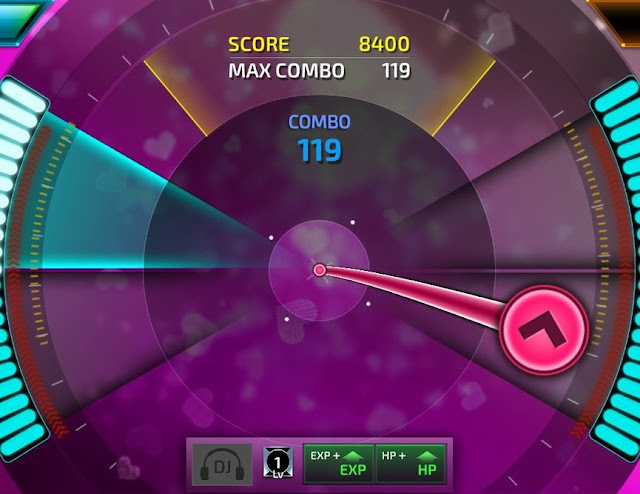 The sheer precision that Superbeat offers, whether you’re using the touch screen or buttons to play, allows the developers to really ramp up the challenge, but do so fairly. The way each track is scored also perfectly fits with the music theme, and so each track feels different to play. And, consequently, each player is going to find tracks outside of their comfort zone difficult to get a feel for. I can nail that Latin American track, but damn I’m terrible at sludge metal. So, yes, Superbeat is superb, but as a result of my desire to avoid a number of tracks like the plague, there's not as much in there as I might have otherwise liked.